Flat feet are a real pain, aren’t they? Pronation, lack of arch support, even conditions like plantar fasciitis ail those of us with flat feet. A lot of the times, it’s genetic. Other times, it’s due to the activities we engage in. But we shouldn’t have to suffer either way! Custom orthotics can really break the bank. Luckily, there are plenty of insoles made for flat feet that can help make flat foot pain literally disappear for a decent price. I’m here to share them with you. Let’s take a look at the best insoles for flat feet. For the best support and structure for your feet, look no further than the GREEN Superfeet Premium Shoe Insoles. I can attest to the quality of these as I’ve used them for years to relieve my plantar fasciitis. With the high-arched support, these insoles provide relief from foot pain related to flat feet. The full-length foam makes these super comfortable for long periods of wear. A deep, structured heel cup cradles the back of the foot nicely. The entire sole is made with durable construction including a hard plastic bottom, which helps with shock absorption. They’re also coated with natural NXT anti-bacteria coating which keeps the germs (and the smell) away. Some may find these insoles too firm or even too high in arch support. It’s important to remember that support is the most important factor for flat feet, so try them out for yourself to see how they feel. Being the top recommended insoles for flat feet by podiatrists, you can’t go wrong. 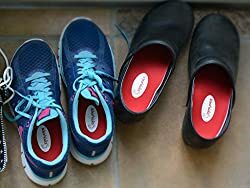 These are some of the best flat feet insoles that you may come across. Support your feet while supporting your country with these insoles. They’re the Powerstep Pinnacle Premium Orthotics, made for mild to moderate pronators and made in the USA. The encapsulated design and semi-rigid shell allow a delicate balance of flexibility plus support. These are some of the most comfortable insoles you could wear. They are also made with a deep heel cradle, which helps protect your feet and body from high-impact activities like running. It also helps stabilize your foot altogether. The top of the insole is lined with heat and friction-reducing, top anti-microbial fabric, keeping your feet cool and free of germs. It also has an awesome double-layer of cushioning making these softer than other models. Some people may find these more comfortable than the Superfeet super supportive version. Others may find that these don’t provide enough support. You’ll know what you need based on your foot pain and foot type. All in all, if you want something on the softer side, which will still provide good support, I would recommend these as the best inserts for flat feet. Next up, we have the customizable insoles from SOLE, the Signature DK Response Footbeds. 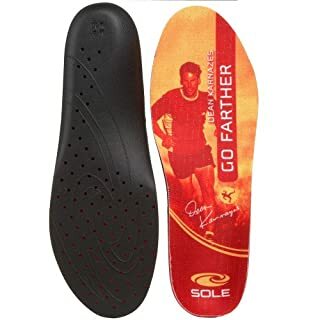 These insoles have been tested by elite long-distance runner Dean Karnazes (therefore, the DK label) to ensure top quality. 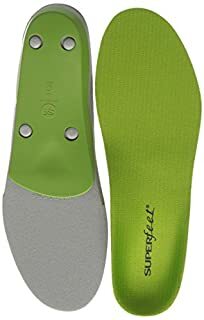 These insoles have a bit more arch support than the Superfeet model but match the similar deep heel cup and moisture-wicking top layer. Added cushioning makes these soft and comfortable to walk in. SOLE implemented improved heel cushioning as well. This helps distribute shock and weight evenly throughout your stride. These insoles are special in that they can be custom fit for your feet. You pop them in the oven for a few minutes to soften the mold, insert them into your shoes, and then stand in them for a few minutes to mold to your foot shape. Of course, you don’t have to do this if you don’t want. The insole will mold to your foot with regular wear as well. I do think the oven trick is a cool feature, though. The customized arch support does wonders for your joints. It keeps your knee to hip joints in alignment, which helps to reduce any unnecessary pain. These insoles should work well for most users who try them out. Did you know that New Balance used to be known as the “New Balance Arch Support Company”? With a name like that, it’s no surprise that they’ve tried their hand at making supportive insoles, and they came out with the best orthotics for flat feet in this model. A separated heel and forefoot cushioning give you padding where you’d want it most- at the beginning of your stride and the end. But what about the middle? I’m glad you asked. The arch support is molded into the insole in the middle of the shoe. Take note of this: Most arch support is placed towards the middle-back of the shoe. These insoles are different because they are made for metatarsal support. So if you find that you need more support to get rid of metatarsal pain, these insoles may intrigue you. Others may find the middle arch support a tad uncomfortable. These insoles are also thick. This could be a good thing or a bad thing depending on your preference. Whatever the reason, these are a good pair of insoles for those of us with metatarsal pain. Try ‘em on for size. On the opposite end, Samurai made orthotics on the slimmer side, slim enough to place on top of regular factory insoles (depending on the shoe). But don’t let the “slim factor” fool you into thinking these insoles lack support. These best orthotics for flat feet are made with a polypropylene orthotic shell and high-density padded case. This means great support for your feet as well as added shock-absorption. The shell also realigns foot joints for lowered pain throughout the lower body. Although the arch support is firm, some may find that it’s not high enough to provide the structure they need. If you think you need higher arch support, you may wish to look elsewhere. Some have noticed the durability of these insoles to be poor. This may make the 60-day money back guarantee look good, just in case you find that they don’t last very long. 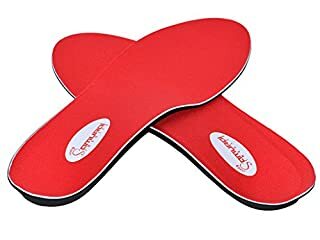 These are the only insoles in this list that provide such a refund for dissatisfaction. 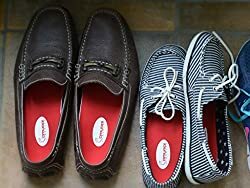 If you find the features of these shoes fits your needs, get ready to fit them into your shoes. Did you ever believe that getting rid of arch pain could be so easy? Well, it is! It’s as simple as finding a good pair of supportive insoles to replace the generic ones in your sneakers. With a pair of shoe inserts for flat feet, your arches can receive the support they need, your feet can become stronger, and your heels can be free of pain. That’s something that I think we all could benefit from. Whichever you choose, you’re bound to be in for happy, healthy feet.